Easy Keto Pulled Pork Lettuce Wraps are low in carbs, full of flavor, and super satisfying. Even if you’re not on the keto diet, you’ll enjoy this healthy lettuce wrap recipe. I don’t know about you, but I can practically smell the fragrant pulled pork by reading that list! 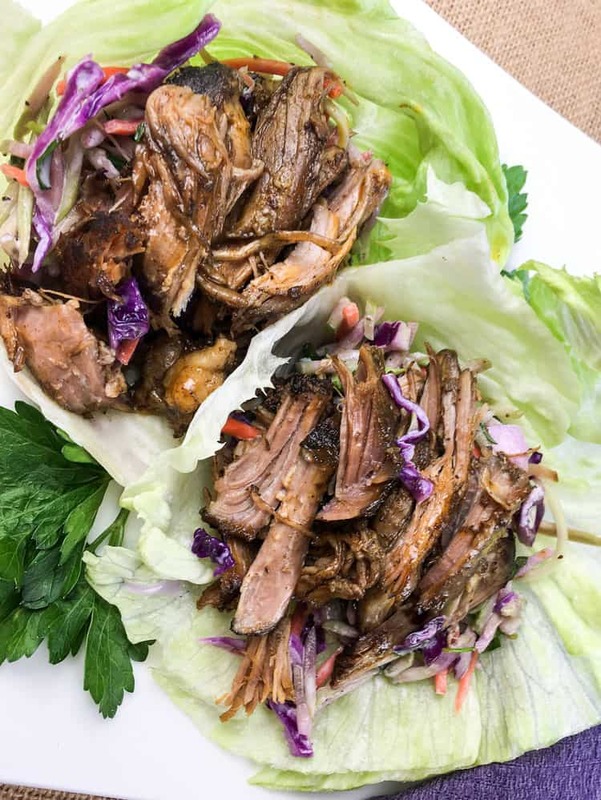 These Easy Keto Pulled Pork Lettuce wraps are so flavorful and so easy to make (you’ll use a slow cooker), plus they’re low in carbs and calories! Can I Eat Easy Keto Pulled Pork if I’m Not on the Keto Diet? Yes! Even if you’re not on the keto diet, you’ll love this lettuce wrap recipe. It’s packed with protein and makes a light, yet filling meal. Thanks to using a convenient slow cooker, these lettuce wraps are incredibly easy to make. They only take about 10 minutes to put together, and the rest of the time you’re free to do something else while your pulled pork cooks to perfection! Step #1: In a small bowl, place cocoa and all spices. Season with salt and pepper to taste. Rub the mixture all over the pork shoulder, then transfer it to a 5- or 6-quart slow cooker. Add chicken broth to crock and cook on high for 4 hours or low for 6 hours. Step #2: Once the pulled pork is done, use two forks to pull apart the pork while it’s still sitting in the slow cooker. Tip: Leave the pulled pork in the juices in the slow cooker and set to warm for 20-30 minutes. This will give it time to absorb even more of the great flavor! To serve: Fill each leaf of lettuce with Broccoli Keto Slaw and top with pulled pork. 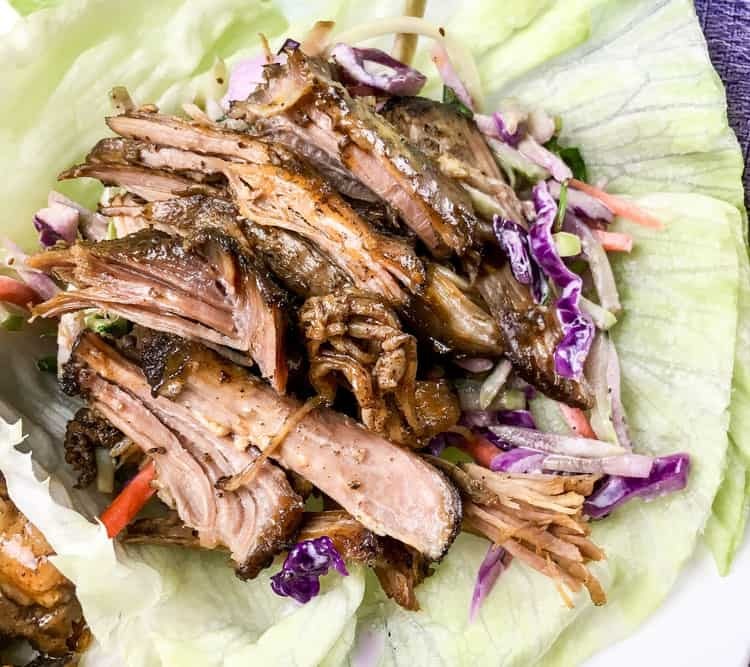 How Many Servings are in Easy Keto Pulled Pork Lettuce Wraps? There are four servings in this recipe, which means each serving is two lettuce wraps. How Many Carbs are in Easy Keto Pulled Pork Lettuce Wraps? This easy keto recipe is super low in carbs! Each serving (the whole recipe contains 4 servings) contains only 16.8 grams of carbs… 10.5 grams of which is fiber! That gives each serving a net carb count of only 6.3 grams. I hope you enjoy these Easy Keto Pulled Pork Lettuce Wraps! These keto lettuce wraps are seriously easy... and delicious! In a small bowl, place cocoa and all spices. Season with salt and pepper to taste. Rub the mixture all over the pork shoulder, then transfer it to a 5- or 6-quart slow cooker. Add chicken broth to crock and cook on high for 4 hours or low for 6 hours. Once the pulled pork is done, use two forks to pull apart the pork while it’s still sitting in the slow cooker. Leave the pulled pork in the juices in the slow cooker and set to warm for 20-30 minutes. This will give it time to absorb more flavor. To serve, fill each leaf of lettuce with crunchy broccoli slaw and top with pulled pork.